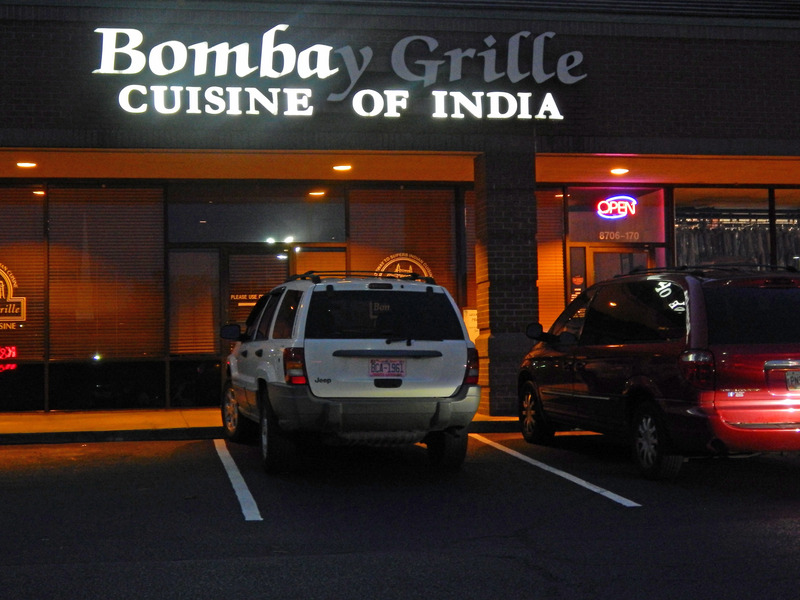 Bombay Grille Cuisine of India is a delightful surprise for vegetarians and especially vegans, tucked away inside an aging shopping center that’s seen better days (Tower Place in Charlotte, NC). From the outside, you may have your doubts … Bomba Cuisine of India, anyone? There’s a large vegetarian appetizer and entree section of the menu. 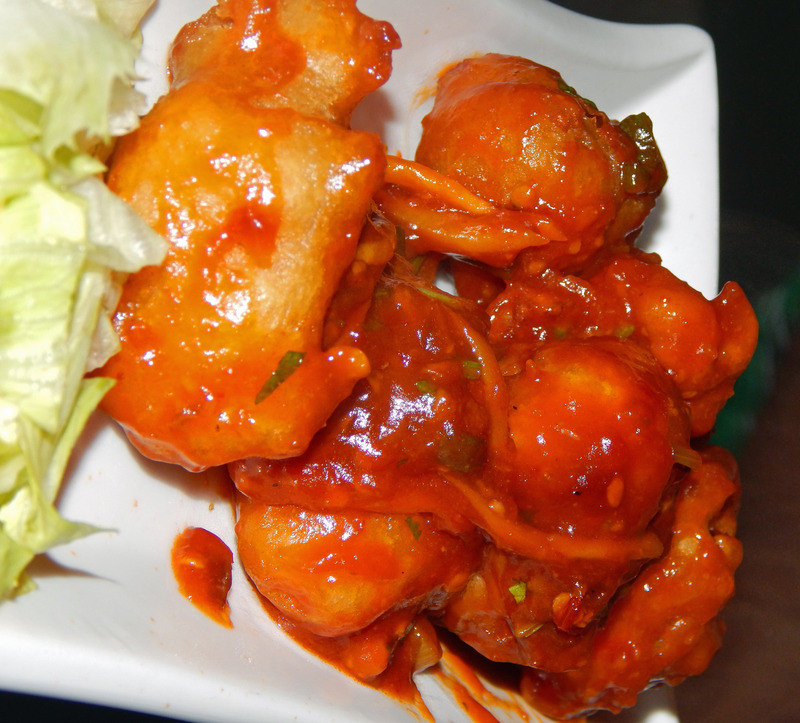 Plus a few other items if you comb through the menu carefully … such as Gobi (cauliflower) Manchurian and Vegetable Biryani. This should be the norm for an Indian restaurant, but sometimes in America things get a little … Americanized. About half of the vegetarian appetizers and entrees on the Bombay Grille menu are “naturally” vegan. And even some of the entrees that are not “naturally” vegan, can be customized and cooked to be vegan! 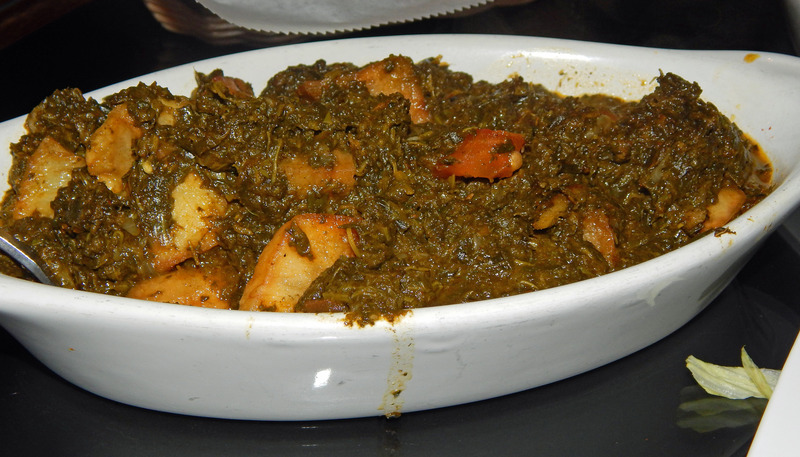 Most notably, the palak (spinach dishes) – Channa Palak (chickpeas and spinach) and Aloo Palak (potatoes and spinach). Aloo Palak, prepared to be vegan. 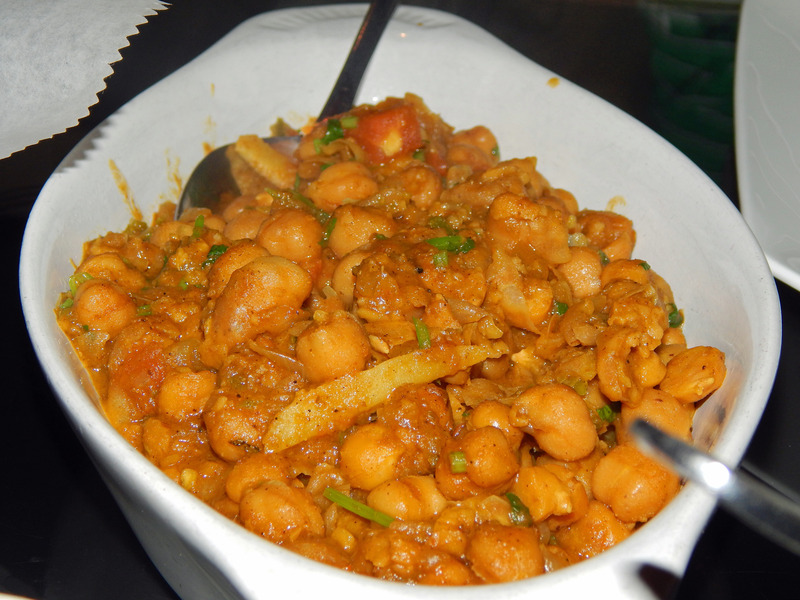 Channa Masala, an Indian dish that is almost always vegan. The food is North Indian style, and each dish has its own unique and distinct seasonings (unlike a few other Indian restaurants in Charlotte, where it seems the same masala is used for every entree). Bombay Grille has very good Roti Bread. As some of you may know, vegan Indian food tends to be “dry” (think Channa Masala), as opposed to a “wet” dish with a lot of “curry” or “gravy”. Dry curries are best served with bread, not rice. Some Indian restaurants, catering to American diners who go crazy for dairy-containing naan, do not even serve breads beside naan. Rotis are reasonably priced at $1.95. Roti. Order this instead of naan – naan almost always has milk. Reasonable Prices. A vegetarian/vegan dinner entree at Bombay Grille will run about $10.95 – $11.95. 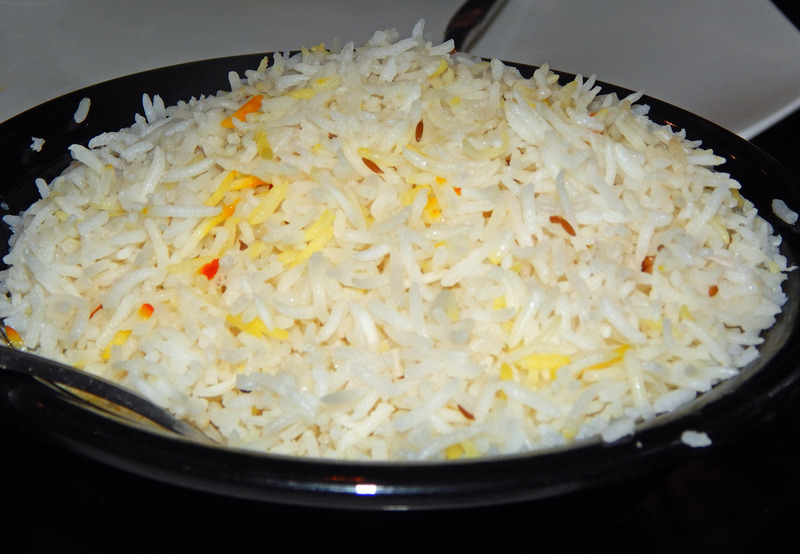 You don’t have to place (and pay for) a separate order of rice – it’s included in your meal. 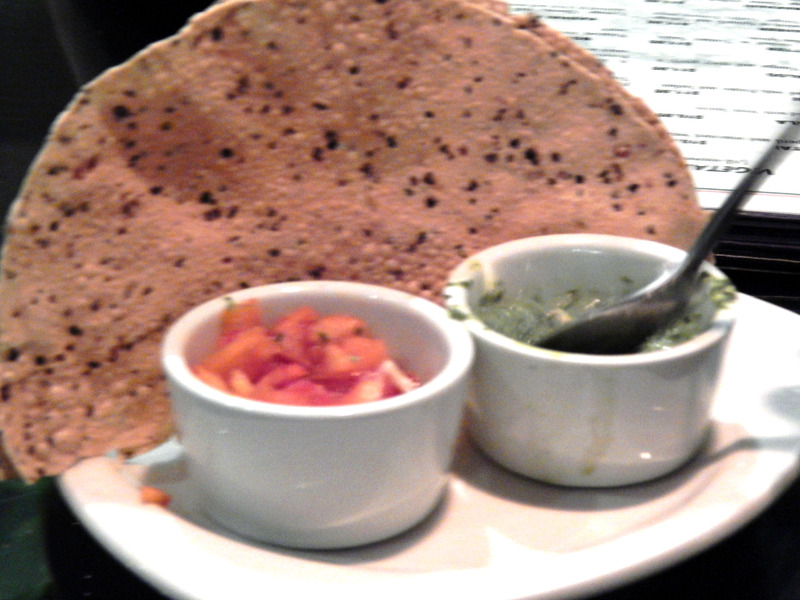 They also include complementary pappadums – sort of a large, crispy wafer – served with chutneys and a kind of Indian ketchup. Finally, unless you have a really huge appetite, you’ll have leftovers to take home for the next day. Rice comes with the meal – you don’t have to pay extra . However, for most vegan dishes, like channa masala, you’ll want bread, not rice. Caveats? I can think of only one – the spice level can jump about a bit. You’ll order your food at a spice level of 1-5. Last time I was there, I ordered a 4, my partner ordered a 3. Mine was pleasantly spicy and hot but my partner was sweating bullets. I’d definitely recommend ordering on the mild side first. Great information I love Indian food but I did not know that Naan had milk in it. 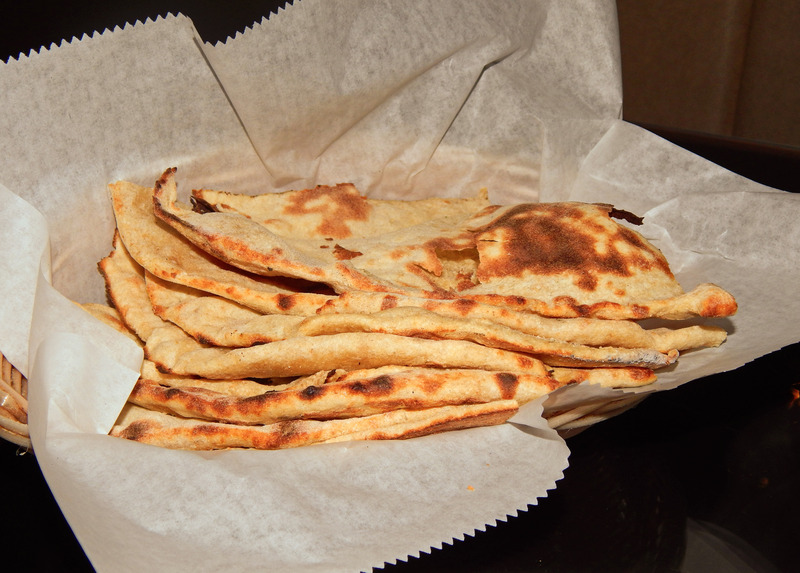 Not all naan has milk, but almost all restaurant naan does! We confirmed the milk with Bombay Grille. However, you can buy some brands of prepackaged naan without milk – Harris Teeter brand, Trader Joe’s, and some of the prepackaged naan I’ve seen at the Indian markets. Thanks Catherine. I will get back there. I’m not a fan of lunch buffets so I usually skip that place but will go for dinner. I’m not a big fan of lunch buffets, either. Usually because there’s not much for vegans to eat. But, also, buffets tend to make their food milder to suit more people, and I like my food quite spicy. I wish more Indian restaurants in Charlotte had a lunch menu. Great. Great Place. If you want it spicy hot it is fine, but i must say,’Not hot spicy at least three times and it will still be as hot spicy as I can eat it. Beautiful decor.. Love Daddy, who does not have a cast iron stomach. We went there last night for the first time in years. It was wonderful. The gobhi lassanwalla is one of the menu items we loved in the past and couldn’t wait to try again (wish I could get the recipe). We also enjoy the pappadums. The knowledgeable waiter patiently explained the differences between the 1-5 spice levels. We ordered the same item, but at two different levels, and we both enjoyed our entrees. Nothing has changed since we were there last. Five stars! Oh, I’m so glad you love this place, too! The waiters make all the difference – they really know what’s on the menu and how everything’s prepared. Plus I find the food to be consistently excellent. Glad you had such a good experience! We love Bombay Grille too! The buffet and the entrees are so flavorful and the servers are extremely friendly and knowledgeable. We are a group of 4 friends that meet each month for lunch and we always choose to go to Bombay. Like someone else said, the staff definitely knows us. Plus, they have lots of coupons on their page on 360Charlotte http://bit.ly/1ACYeoM which makes it even better to save some money for an already reasonable dining experience. One of our favorite places in Charlotte for sure!